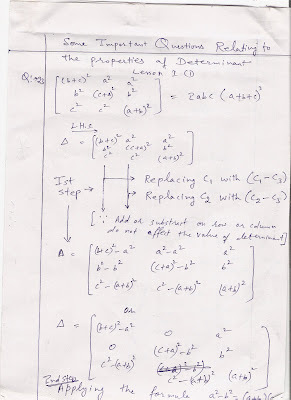 Here , I am giving you the full detail of properties of determinant for your education purpose . The following properties are very helpful for commerce student to calculate value of determinant without using of expending procedure . If we transpose of any matrix and then calculate the value of determinants, there is no difference between original value and transposed matrix’s determinant. If all the elements of any one column or row of any matrix are zero, then the value of determinant must be zero. If any two rows or column’s all value are same then the value of determinant must be zero. If any two rows or column of any matrix are proportionate, then the value of determinant must be zero. 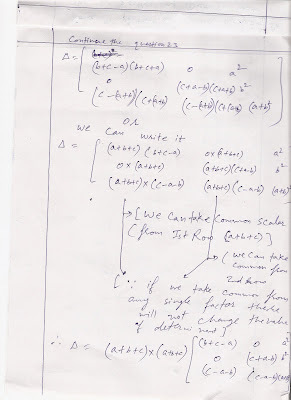 If we multiply any row or column with any scalar, its value of determinant will also multiply with same scalar. 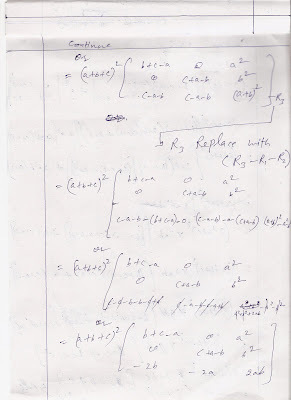 If take any common factor from any column and write outside the matrix then the values of determinant never change. If we calculate the value of any diagonal matrix then it always equal to the multiplication of its all main diagonals. 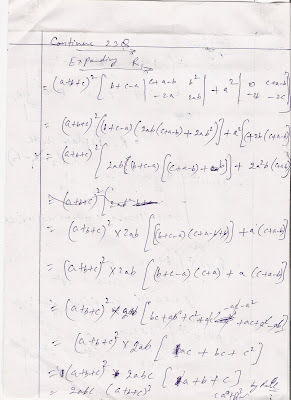 Following are the Scan images of Example of one Question which I have solved with the help of properties of determinant . I think this will be more helpful for you to undersand properties .